Asia: West and Central Kalimantan in Borneo, Indonesia. Males tend to be more slender and colourful than females. Puntius rhomboocellatus works well with other Barbs and Rasboras, as well as small, peaceful Loaches and Gouramis. They should be kept in groups of at least 5. Reportedly they are not fond of flake foods, however this is changing over time as generations are tank reared. 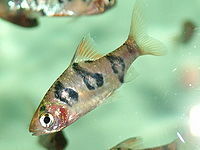 Their preference is live or frozen food such as bloodworms and daphnia or mosquito larvae. P. rhomboocellatus thrives in soft, slightly acidic water, preferably with peat filtration. A dark substrate and subdued lighting (from floating plants) best shows their delicate colours. Complete the tank with plants, rocks and driftwood, leaving an open area in the middle for swimming. Puntius rhomboocellatus is an active, peaceful shoaling (schooling) fish that is a blast to watch. However, they will become timid with boisterous fish. This fish is very similar to the Five-Banded Barb, however, P. rhomboocellatus stripes are wider and more random, giving them the "snakeskin" appearance.